Action needed! Contact your legislator in support of HF483 and 284! The Minnesota Council on Disability supports the advocacy of Quinn Nystrom, national diabetes advocate and MCD Region 5 Council member, who is committed to the over 500,000 Minnesotans with diabetes, one of the many hidden disabilities. Nystrom testified on Minnesota House File 485 and 284. These bills address the skyrocketing costs of insulin and the need for transparency in insulin drug prices. Both bills are still moving through the Minnesota Legislature. PLEASE contact your legislator today to support HF485 and 284. Find your legislator. Star Tribune reporter Glenn Howatt discusses what Stephen Schondelmeyer, a nationally recognized drug market researcher at the University of Minnesota College of Pharmacy, calls “deceptive market practices,” and how those practices affect Minnesotans with diabetes. Read Howatt’s article. 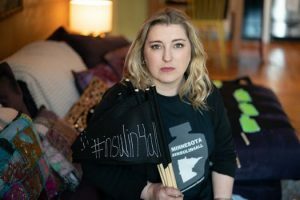 In the Star Tribune article published on March 2, 2019, “Minnesota Patients Paying the Price of Drug Roulette,” Nystrom tells us how her insurance company demands compliance to unreasonable and unhealthy requirements in order to cover her insulin prescription. She states, “They make you do this thing called ‘fail first’. They make you go on [a different drug] to prove to them that it does not work. To me it is so absurd that that process would be OK.” Quinn tells us that she got sick on the drug the insurance company required her to “fail first” with, and how she fought for her coverage, yet still had to pay out of pocket an astronomical $595 a month for insulin, even after complying with processes that caused her harm. Quinn can also be heard speaking on this issue on Baxter radio station KAXE. Listen to Quinn’s interview. Disclaimer: MCD cannot guarantee the digital accessibility of outside sources. MCD has reached out to KAXE for a transcript of this radio broadcast. We will post a follow-up if we are successful in obtaining the transcript. CALL TO ACTION: CONTACT YOUR LEGISLATOR IN SUPPORT OF THESE LIFE SAVING BILLS, and follow Quinn Nystrom on Twitter: @QuinnNystrom.